إن فندق Blue Waters Apartments بموقعه الممتاز في لابرادور هو نقطة انطلاق جيدة لنزهاتك في جولد كوست. يمكن من هنا للضيوف الاستمتاع بسهولة الوصول إلى كل ما تقدمه هذه المدينة النابضة بالحياة. يوفر الفندق بفضل موقعة الجيد وصولاً سهلاً إلى أهم معالم المدينة.
. كما يقدم Blue Waters Apartments الكثير من الخدمات لإغناء رحلتك في جولد كوست. لضمان راحة ضيوفه، يقدم الفندق الخدمات التالية: أمن على مدار 24 ساعة, واي فاي مجاني في جميع الغرف, خدمات بريدية, خدمة حجز التذاكر, خدمة سيارات الأجرة . تتضمن كل غرف النزلاء وسائل الراحة والتسلية المصممة خصيصاً لضمان الراحة القصوى للضيوف. سواء كنت من محبي الرياضة أو كنت تتطلع لتفريغ عناء نهار صعب، ستجد خدمات ذات مستوى عالي بانتظارك كمثل متنزه ترفيهي, حديقة مائية, قوارب, بولينج, كنو. إن Blue Waters Apartments هو خيارك لخدمة الفنادق الراقية في جولد كوست. Located just beside the sea and 10 mins drive away from the ocean. Quiet location as compared to living at Surfers Paradise. Friendly and helpful staff.. especially Darren who was tending the reception. No worries if you guys did not buy any tickets to any attractions as these can be booked at the reception. Alot of helpful brochures available as well. Quick check in and out, good security, reasonable price. Good location. Need to have a car otherwise it is very troublesome . The only thing I do not like is they expect u to clean up the place when u check out otherwise they will charge u for it , also they don't refill the milk , tea and coffee during your stay. Nice pool, surroundings, close to theme parks. In a quiet location away from the main areas but not accessible to the tram (only buses). 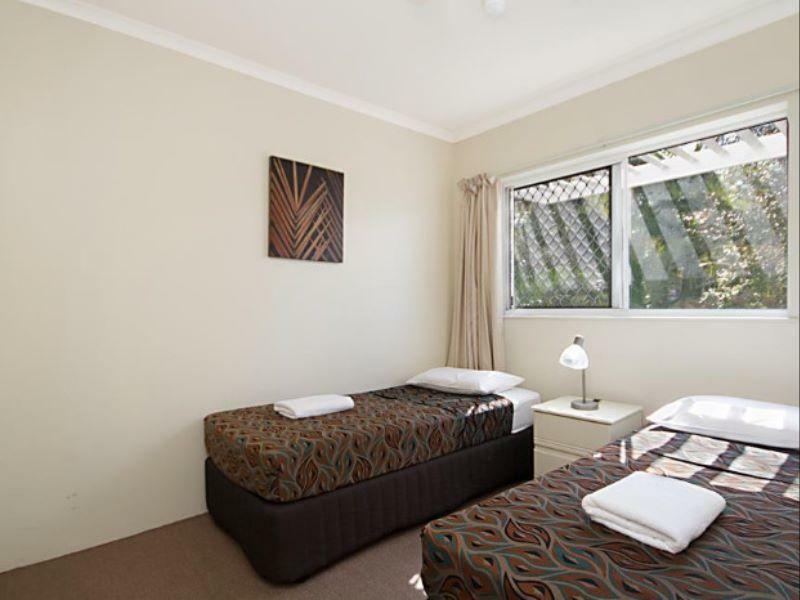 Close and easy access to the theme parks, SeaWorld and Movie World. Good Mexican restaurant and convenience stores only 5 minutes walk. A nice two bedroom apartment limited by a/c only in the lounge (fans for the bedrooms). A large balcony that we couldn't use or even open the sliding doors or curtains due to painters coming on and off the balcony (we were never informed of their constant coming and going)for the entire 5 days hence no privacy. Luckily we had a low floor or you could have 3 flights of stairs (great if you can and want the exercise but hard with a young child). Advertised foxtell but none available during our entire stay. Booked in on a Sunday. Even though we read the fine print no one available to assist with check in and disturbed twice during our stay with people knocking on our door trying to get someone to get their keys to start their stay. Staff friendly and helpful during office hours although we were charged $4 for a bowl our 2 year old broke ($1 in Woolworths) and given we did not receive the advertised services of foxtell, and total lack of privacy. Great pool with 50% 1.2 metres (my wife can not swim) and 50% deeper. Looks like owners are cleaning the facility up maybe to sell. We would not return or recommend at this stage. Great place to stay as a family of four plus in laws. Only negative was stairs to 3rd floor, which wasn't an issue for us but could be if you are not able bodied. Shore head needs replacing too, but did the job. Very clean. Lovely place to stay, we would gladly go back! Have stayed here before and was pleasantly surprised. Was not disappointed this time either. Rooms are very clean. For the price it is hard to beat. Kids love the pool. 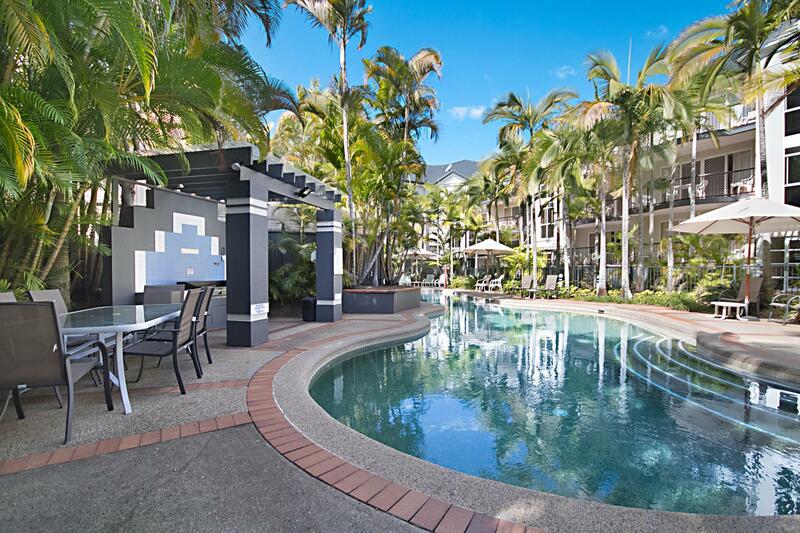 Is very handy to Harbour Town and has great restaurants across the road or within easy walking distance. Away from the hustle and bustle of Surfers but close enough (5-10 minute drive)if you have a car. I would not stay here if you wanted to go to the beach and you did not have a car, although public transport at the back gate. The stay was very good. All that you need for a good stay is there except there is no food serve. You need to either buy it from somewhere else or order from the brochures they provide. 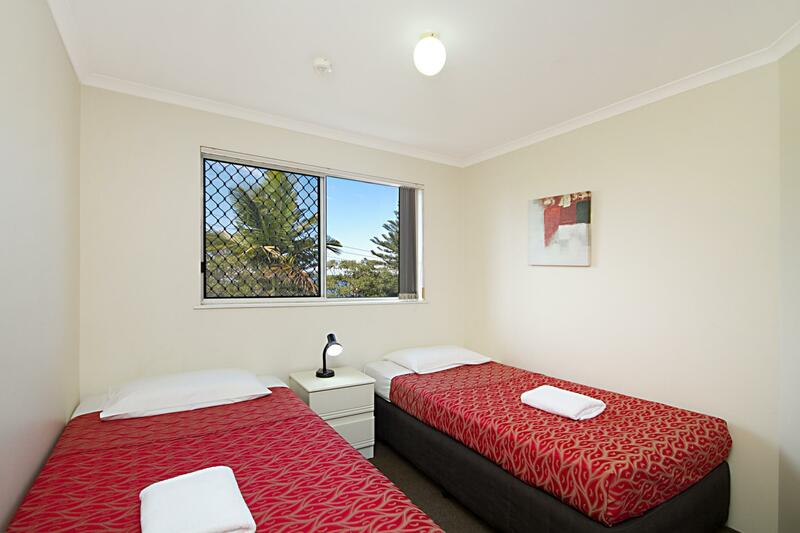 Very spacious for 2 adult and 2 children in a 2 room apartment. Complete kitchen appliances and linen with first supply of basic needs. 1) Conveniently located. Near Seaworld, Australia Fair and Harbour Town Outlet. Nice room over looking pool. Put me into holiday mode. Speaking of pool, what a great pool! 1 side of bed feels like it collapsed so hubby thought it was uncomfortable. Great location to move around and explore Gold Coast. Secured place. Ample room space. Poor wifi connectivity. Staff claimed could be our mobile sim card problem, but this is hard to believe because we have been in Australia for 6 days before arriving in Gold Coast and never had wifi problem in Melbourne, West Wyalong, Goondiwindi. Service could improve in terms of room cleaning, especially when we spent the entire day out and would not have opportunity to voice to staff our needs, e.g. change towels after 2 days. Slow in refunding the deposit. The stay was fine, we were hardly there as we were visiting family for Christmas. The complex is dated and needs refurbishing and didn't feel that clean. Kitchen not very well equipped for a fully equipped apartment. Only one air conditioner for a 3 bedroomed apartment was ridiculous as it didn't cool the bedrooms down. Bedding configuration didn't suit a family of six at all. Would have been unsuitable had we been staying longer. Generally pretty good, but the showers had some mould, and there was a cockroach living in the dishwasher. Based on this I was offended they expected everything to be clean upon departure otherwise they would charge me $50. Also around the pool area there are a number of areas that are uneven, safe yourself a lawsuit, get it fixed! Prompt transition on arrival, had to carry 3 suitcases up 4 levels of stairs, no elevator! Room had a strong musty odour, some dishes were put away still dirty.Very noisey next to a busy road, ensuite shower door too narrow, 2 minute showers????? Other wise served it's purpose value for money and not far from theme parks. Love the location. Very grateful the hosts stayed on beyond their office hours to receive us. However what would make it perfect is if there was aircon in the rooms too. Also the fans were dusty so we didn't bother to use them either. Good location, Great pool. Good size living areas in apartments. This was the second time we have stayed at Blue Waters. The rooms especially bathrooms are dated with some water damage causing slight damp/musky smell in ensuite. The air-con in apartment and the pool were greatly appreciated as temperatures rose high into the 30's. We were there on a weekend and slept well in a comfy bed and noted it was quiet in terms of outside traffic/people noise. Bathroom could have done with a better clean - hair in the shower. Unfortunately, the week we were there the next apartment block was having a driveway re done, which meant 7am machinery starts each morning, not the fault of Blue Waters. Our stay was pleasant, but I wouldn,t call the units luxurious as stated. They were ordinary rooms which were clean and tidy. But we stayed when it was cold and there were not enough blankets and the reverse cycle didn,t work so we didn,t have any heat.